One major change in composition of the G8x8 from 2008 to 2017 is the new appearance of India↑ to country rank 7, and the fall of Russia↓ from rank 8 off of the chess board. 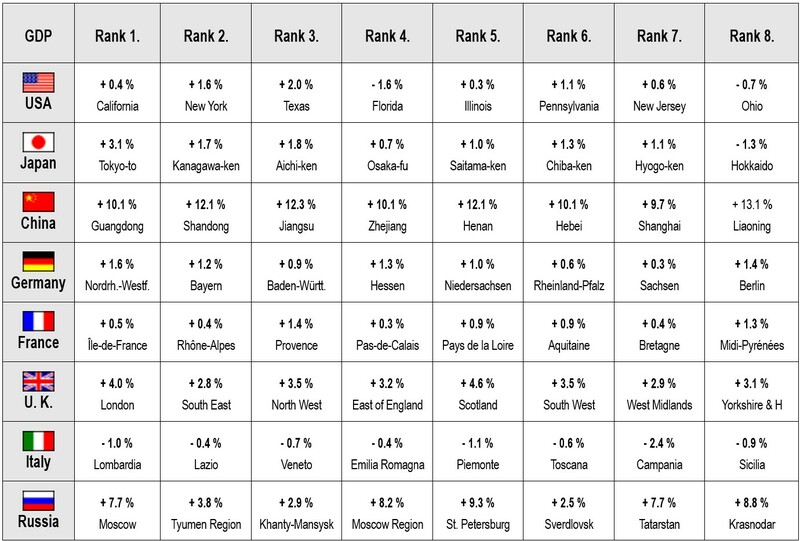 Japan↓ and China↑ switched positions 2 and 3, and the UK↑ surpassed France↓ for rank 5 with France dropping to rank 6. Italy↓ dropped from rank 7 to 8. Only the USA maintained their position at rank 1, and Germany at rank 4. USA: Texas↑ and New York↓ switched postions 2 and 3; Ohio↑ and New Jersey↓ switched positions 7 and 8. China: Shandong↓ and Jiangsu↑ switched positions 2 and 3; Hebei↓ dropped from rank 6 to 7; Sichuan↑ newly appeared in the top 8 at rank 6; Hunan↑ appeared at rank 8; Shanghai↓ and Liaoning↓ dropped out of the top eight. Japan: Osaka↑ rose from rank 4 to 2; Kanagawa↓ dropped from 2 to 4. Germany: Berlin↑ and Sachsen↓ switched ranks 7 and 8. UK: No change within the country. France: In 2016, names and territories were changed, which make the 2008 and 2017 chess boards incompatible. India: New on the chess board. Italy: No change within the country. In 2008, we also compared GDP growth rates between territories. Number one growth territory was Liaoning province of China with a growth rate of 13.1 percent. The fact that this most promising province of 2008 later fell off the chess board convinced us to discontinue the publication of short-lived growth indicators. Within all of the universe’s recognizable dimensions, God is always present. God’s density is approximately equivalent to the density of the universe, like a person’s density is approximately equivalent to the density of his or her environment: water, rock, dust, but not the density of the core of stars or the void between galaxies. God is conscious. It is able to control Its density and therefore Its presence in things. When God increases Its density in individual things, Its density in all other things will decrease proportionally. God only increases Its density in individual things if It recognizes a good reason to do so. God is good. During Its normal density in things, positive and negative events are in balance. If God increases Its density locally, positive events dominate, but they are being compensated by more negative events elsewhere in the universe, because God’s density has been smaller there.